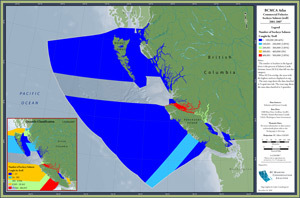 description — The map displays the number of sockeye salmon commercially caught by troll (2001-2007), displayed by salmon catch estimate areas. The spatial data also includes total number of boat days for years fished, although this is not displayed on the maps. Please note that DFO recommends that the 2001 data should be excluded because they were collected before refinements to the collection methods were established. restrictions — There are restrictions set on BCMCA distributing the raw data.